During the Make it Green in 2015 Campaign, we've discussed how to make more healthy and ecologically friendly choices for our entire family. 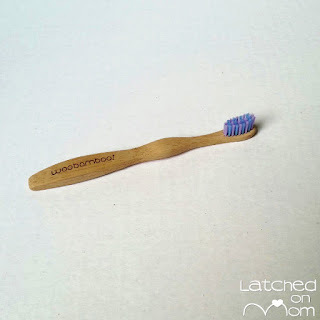 When I came across WooBamboo Eco Toothbrushes, I was super excited to know that there is a company that cares about our Earth and the health of my family, just like I do. WooBamboo was founded by Steve Hyde, Christopher Fous and Tom Burt who are all about the idea of an easy to use product that inspires people to keep making eco-friendly decisions. By using bamboo from a sustainably harvested, organically grown source, WooBamboo Eco Toothbrushes aren't just eco-friendly but Panda friendly! The bristles are Dupont Tynex nylon applied to the brush using aluminum staples rather than glue. When your toothbrush goes kaput, the entire handle will biodegrade! With plastics ALL around us, we're constantly in an environment with the chemicals used in manufacturing them, such as BPA- a chemical used to strengthen/harden them. BPA can disrupt the brain, affect behavior (1) and The National Toxicology Program has linked to other health care concerns (2). Phthalates are chemicals used to mold plastics and are known as a carcinogen (3). They have also been shown to cause birth defects (4). Avoiding BPA and Phthalates from coming in contact with your little ones seems to be the healthier way to go. WooBamboo knows that this is something parents are concerned about and you can be ensured that the entire line of toothbrushes are free from these chemicals. 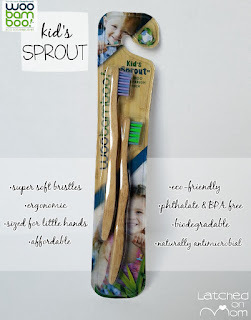 The kid's line, called SPROUT has bristles that are super soft for sensitive teeth and gums, perfect right from the first tooth. The handles are ergonomic and sized just for little hands. WooBamboo Eco Toothbrushes are very appealing with bright double colored bristles, which was something my 5 year old noticed right away- she had to have the pink and blue one! 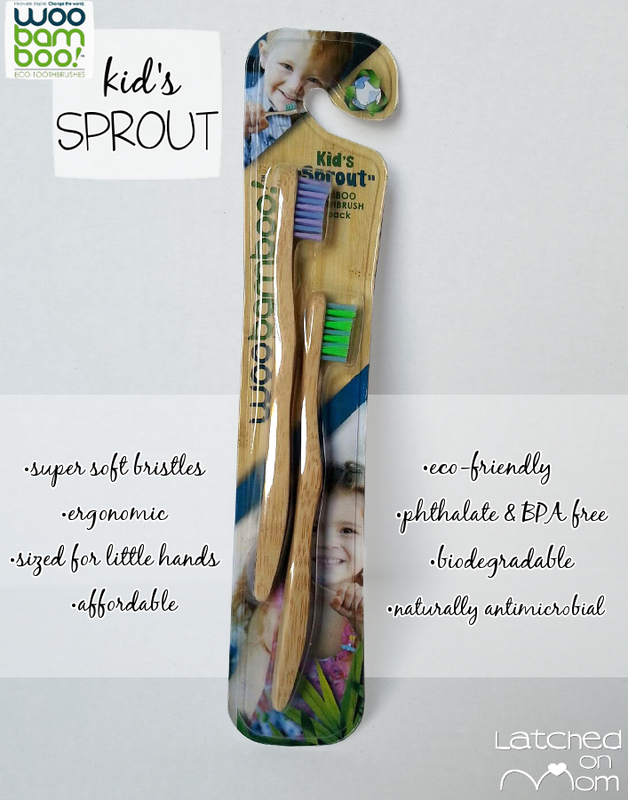 WooBamboo Eco Toothbrushes are for kids, adults and there's even a pet line too! For the adults, the handle options are either Standard or Slim in Super Soft, Soft or Medium bristles. You can find WooBamboo coming soon to places like Target or Lucky's Market, but right now you can SHOP on Amazon (thank you for supporting my blog by shopping with my Amazon affiliate link)! WooBamboo continues to show their passion for being eco-friendly by using soy-based ink on recycled packaging that's recyclable! This is a great company and my experience is wonderful! I think you'll love WooBamboo too! Making small changes, like swapping out your plastic toothbrushes may not seem like it will impact much, but it does. How many plastic toothbrushes do you throw away a year? How many per your city? How many per your state? You can be the change. You can teach your kids it's easy to make that change! What is my favorite thing about this product? My kids love their WooBamboo Eco Toothbrushes, and I feel confident these toothbrushes are safer than most other toothbrushes available on the market. My family is proud to be doing something better for our health and for our planet's well-being! Is there anything I'd change about the product? I wish WooBamboo would go completely biodegradable, but pig hair in a toothbrush is just wrong in my opinion. I do not know too much about other natural, plant based fibers that would work, but if there's something available, I'd be happy to have that as an option! I give WooBamboo a 9.5/10! LIKE WooBamboo on Facebook to keep up with special deals and promotions and don't forget to also FOLLOW on Twitter! I never thought about switching my toothbrush to a natural product! I'm pretty amazed that this toothbrush exists. It's going on my Amazon wishlist! I like that it's biodegradable and they don't use glue to hold bristles in. And they're cute! I've never heard of a bamboo toothbrush! I always wondered and wanted to try bamboo toothbrushes myself. Thanks for your review. Looks like a long lasting product and it being economy friendly is such an awesome thing! I watched the documentary called the human experiment. It was a lot on BPA and I did a study on it in university. But never thought of it being in my toothbrush. crazy! Would love to try these tooth brushes! I've never tried a bamboo toothbrush. It's great that so many plastics are starting to be replaced. I've never heard of bamboo toothbrushes before! How interesting! I have never seen these before! Its amazing how much plastic is around us and we don't even realize it. I would deff buy these! 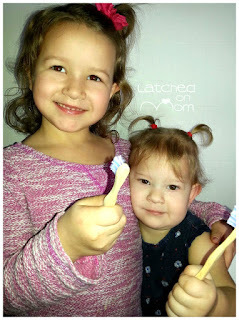 We have never tried a bamboo toothbrush! Im loving that its biodegradable though!! I try to make earth-smart choices, but never knew this was an option! I love the idea that the handle is biodegradable when it's time to get a new toothbrush. I have never herd of a bamboo toothbrush or tried! Great review thanks! Really wanting to try this one also. I'd really like to try this! I have not yet tried a bamboo toothbrush, but I'm very excited to. This is a good review. However, I'm sad that I have to still throw this one away, and as you said, it isn't completely biodegradable. I wasn't aware of these. Thank you for the information. I have never seen these before, I will definitely check them out. I've never used a bamboo toothbrush before, but they look really neat. I love how eco-friendly they are! I didn't realize how a toothbrush can impact our planet. I think bamboo toothbrushes are a great idea. It's the small things that add up to make a big difference. We've never tried a bamboo toothbrush. I never knew they existed! We have never tried bamboo toothbrushes. These sound wonderfully green as they are biodegradable. i love the idea of a toothbrush made from renewable resources that is biodegradeable. Though have never tried one. I have never tried a bamboo toothbrush but I'd love to! We've never tried a bamboo toothbrush but would love to! I've never seen a bamboo toothbrush. Would love to try this! I've never tried a Bamboo Toothbrush. In fact, I've never heard of this item. Ive never tried a bamboo toothbrush before. Never knew a natural product like this exsisted. Interested to try. Was not aware there were natural tooth brushes like these. We have never tired a Bamboo toothbrush before. I have never known about these before but they seem very cool! These are so neat! I honestly never thought about the fact that we throw out old plastic toothbrushes. It's great that these are biodegradable. These toothbrushes look very nice. Thanks for sharing!